Is there a policy on flagging questions for speed closing? 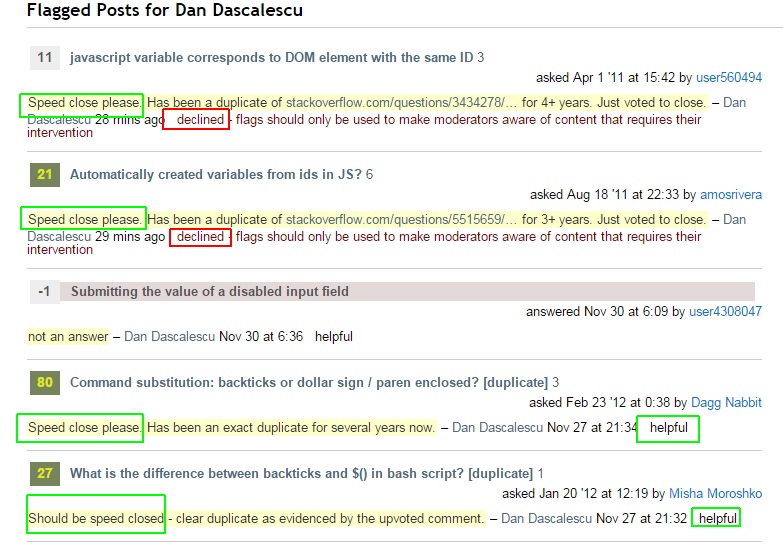 Example use case: duplicates that haven't been closed for years. I've submitted such flags, and some were accepted, while others were declined. Vote to close and let the close queue handle the rest. It's not a moderator's job to do those things. It's not an exceptional situation and it's not something that requires moderator attention. It takes 5 votes to close for a reason. The only reason some of the flags were approved is that some mods are more patient than others and they had some free time on their hands to help you out with closing a duplicate. Please do not take this courtesy for granted. If you think that the questions should be closed, then vote to close them. If there is some particularly important and urgent reason why a particular question really needs moderator attention, and that regular community closure is insufficient, then you would need to explain why that question is so special when flagging it. That the question has gone several years without being closed is not a reason to require moderator attention. The correct course of action for the moderator is to decline your flag. Of note; if you have demonstrated that you are an expert in the field of that question (as demonstrated by having a score above 1k in a tag used on that question) then you could close it as a duplicate all on your own. Not the answer you're looking for? Browse other questions tagged discussion flags vote-to-close declined-flags . Is closing old questions a gigantic waste of time and effort?